"To chair the Jury of such a festival is for me an honor and an embarrassment at the same time, because if I am flattered that I am proposed this task, I deeply think that a journalist is only a witness, and that in this respect it is not him who is the center of interest. Through their activities, the sportsmen, the artists, all those who realize something create the event, providing the observers that we are the necessary material for their action. The fact remains that the prospect of chairing this jury is a delight for me, because it reminds me of another festival of auto-moto films, which I participated as a member of the jury throughout the years 1970-1980 ". 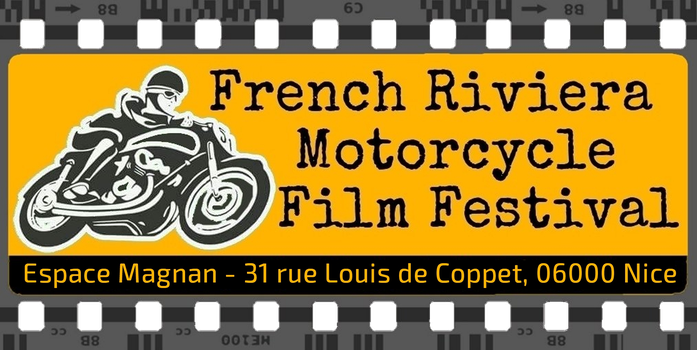 Real living encyclopedia of the motorcycle world, Jacques Bussillet gives us the great honor of being the second President of the French Riviera Motorcycle Film Festival Jury. His journalistic career is enough to leave you speechless, judge by yourself : After being graduated in 1968 he is studying journalism in Strasbourg. He spends the summer of 69 to follow Continental Circus as a mechanic of New Zealand's rider Keith Turner (he had a 250 Aermacchi and a 500 Linto), then Frenchman Jean Louis Pasquier (50 Derbi, 125 and 250 Bultaco). He meets François Beau who offers him to write his adventures for "Les Motards", but when he returns to France in October 69, this paper no longer exists, because its founder, Jean-Pierre Drexler, has just killed himself in Montlhéry . In the early 70's, Jacques writes his first report for "La Moto". He then spent all summer 70 in Paris to work with François Beau and the team of this magazine. In 71, creation of the weekly "Automoto" which will give him the opportunity to meet Patrick Chapuis who hires him to cover the Grand Prix for "l'Equipe". He joined "Moto Journal" in autumn 73. Until 78, he covered the GP for "l'Equipe", for "MJ", but also for "La Moto" and English magazines. A real Stakhanovist of the typewriter! It must be said that he was the first motorcycle journalist in France who went through a school of journalism. In May 1978, he became editor-in-chief of "Moto Journal" and will remain so until May 84. He resumed his freedom and became a freelancer, just to repeat a tour of Grands Prix and African rallies for 5 years, until end 88. But "MJ" catches up and offers him to lead all motorcycle sectors, there is of course "MJ" but also "Moto Crampons", the specials, in short enough to occupy him. He stays there until December 99. He takes again his freedom and continues to write articles and many books on the world of the motorcycle (biographies, those of Christian Léon and Barry Sheene among others and other books with fascinating subjects such as the Tourist Trophy or Continental Circus). - Source Bike70. Lydia really is a girl apart. She defines herself as Founder of the Mag'Motardes, a graduated educator, and a pluridisciplinary amateur rider. That's what she is and her excellent blog that highlights women in the world of motorcycle is really worth consulting. She should have been with us during the first edition but the terrible accident in which she was injured during the Africa Eco Race prevented her to come to the Festival. She relies fortunately little by little and it is with great pleasure that we will finally have her in the Jury of this 2nd edition of the Festival. Didier de Radiguès is a former Belgian motorcycle and car racer of the 1980s, multiple Grand Prix winner, sports commentator on Belgian TV channels, Moto GP rider manager and co-owner of a motorcycle school in France and in Belgium, the "De Radiguès Rider School". After his sport career he also became an artist photographer. He is represented by the "L Gallery" and exhibits his photographs in many countries, from New York to Singapore via Brussels and Paris. President of the association "Esprit Motard 06"
After she met the man and biker of her life, Nicole decides to pass her motorcycle license. Because freedom, smells, sounds, it's so much better when you drive yourself ...! For the autonomy of the biker, in her life as a woman and for the feeling of being able to lead his life ... After 10 years in the service of the motorcycle community in the claim as much as in the accompaniment, a desire : to share with others these moments of mutual help, happiness and solidarity very particular, and to act for others. Hence the creation with many companions of Esprit Motard 06, for the sharing of a common passion, so that the road is always a pleasure. Motorcycle journalist, he created and published for 5 years RAD magazine whose editorial line claimed to meet people and workshops that make the motorcycle of character. The RAD Magazine online site continues this editorial adventure that also extends into various adventures still related to the world of motorcycle of character, including the space dedicated to the preparers at the "Salon du 2 Roues" of Lyon and other collaborations.